My baby steals my phone to keep watching this Catalonia video over and over again. And we don’t encourage her to have much “screen time” at all: we prefer her to play. But in this case, I can’t blame her: this video is the cutest thing ever. I like everything on it: the landscapes, the music… even the fonts of the titles! The Generalitat de Catalunya created this video to present our land in international tourism shows, and it’s now going viral. A very simple plot: two girls are sightseeing and they see a musician singing and playing the guitar. Then they cross him again in a train station from the distance, but as he enters the train something drops off his bag and the girls see it: too late, before they can reach him, the train has closed his doors. 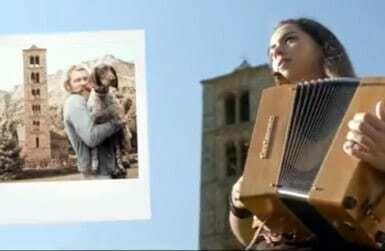 The girls see that what the musician has lost is a travel diary around Catalonia, and they decide to follow his journey. Will they ever find him again? The video follows them around Catalonia as they visit all the sites in the musician’s travel journal, each area identified to a certain instrument playing the song the musician was playing when they first met. It’s a really happy tune, that you’ll be soon singing all day long! Would you like to know where the girls go on their journey around Catalonia? We’ve made it easy to you! The girls and the musician cross in Hospital de Sant Pau, a gorgeous modernist building that was an active hospital until very recently and now is a little-known site, perfect for those wanting to go away from the tourist crowds (we visit it in our Eixample Tour and we love it!). It’s not far from the famous Sagrada Familia church by Gaudi, which is why the video shows the girls taking selfies for a second in front of the most visited monument not of Barcelona, not just of Catalonia, but of the whole Spain. The girls and the musician cross in a train station. An outdoors train station in Barcelona? You won’t see many of them! In Plaça Catalunya you’ll be able to take the FFCC trains that go out of town, and the first stations in districts of the Collserola range are precisely outdoors: Baixador de Vallvidrera and Les Planes. However, the movie makes went a bit further away: the one in the video is the station of Bellaterra, a 30 minutes train ride on the S2 and S6 lines. The journal takes the girls exploring the area around the city first, and they go to the Mountain of Montserrat, the most popular destination for a day trip out of Barcelona. They don’t just stay around the Monastery area: as a flute starts playing the video tune (the same the musician played at the Hospital of St. Pau), they go on a hike to St. Jeroni, the highest peak, from where they see spectacular views. In real life not many tourist take that path as it takes around 3 hours to get there (plus the hike down), but it’s doeable (and even kids friendly!) if you plan a full day in the mountain and bring some picnic to eat at the mountain top – or even more fun: buy some cheese at the farmers market in the Monastery area, then some bread and cold cuts at the bakery next to the souvenir store. The girls next head South, stopping in El Vendrell to visit the home of the famous cello player Pau Casals (you’ve guessed it right, now the video tune is played by a cello), then relax in the golden sand beaches of the Costa Daurada, and visit the athmospheric ruins of the Cartoixa d’Escaladei Monastery in the Priorat wine country as a piano takes over the song. They taste some wine near Horta de Sant Joan and go for a bike ride in the Via Verda de la Vall de Zafan (that follows an old train track). They also walk around the old town of Tarragona (one of our favorite off the beaten path day trips! ), taking pictures in front of the Cathedral and from the top of the Pretorium Tower, before a catchy drum break marks the end of the Tarragona section from the Roman Amphitheater. The journey continues inland, where a violin receives the girls in The Seu Vella (old cathedral) of Lleida, where the girls hung up in its spectacular cloister before realizing they have to run to take a train: the Tren dels Llacs, that takes you to the Pyrenees on a picturesque ride along lakes. The girls hike along the impressive Congost de Montrebei, an old path excavated in the rocks of a narrow canyon, not recommended for people with fear of heights. As they get deeper into the Pyrenees, one of the traditional instruments of this land, a diatonic accordion, welcomes them to the Bohi Valley, home to 1000 years old Romanesque churches now declared Human Heritage by UNESCO. They arrive on time to see the Falles: people carrying flaming trunks to the village from the forests at night, to celebrate St. John’s Eve (if you want to see them, you’ll have to time your trip to be there by mid-June to mid-July, though). The girls finally arrive where the Pyrenees die as they reach the Mediterranean Sea: Cadaques. A small choir gets the baton now, singing from a fishermen boat as the girls visit Salvador Dali’s house museum in Portlligat and enjoy Palamós shrimp in the Costa Brava before heading to the gorgeous medieval town of Girona. SPOILER ALERT! That’s where they finally find the musician, playing a concert with his band in the scenic stairway of the Pujada de Sant Domenech (a favorite photo stop in our Girona excursions, featured in Game of Thrones, too). They’ll hand him his travel diary back when the concert is over. The musician that stars this video is Steve Smith, an Australian song-writer, singer and guitar player. 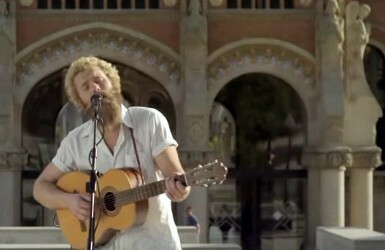 However, the song isn’t his: it’s a cool adaptation of Jaume Sisa‘s “Qualsevol nit pot sortir el sol“. It is possible that Smith composed the new arrangements rather than just played them, but I haven’t been able to confirm that. I must say I like this version much more than the original from 1975: it’s much happier and catchy. The video song focuses mainly on the chorus welcoming home in a cheerful and optimistic way. The long list of guests (fairy tale, children song and cartoon characters), which in my opinion is long and sort of boring, has been cut off the video version. Prefer Amazon for music? Here is the link to the song by Jaume Sisa. So what about you? Head to the comments below and tells us: which site from the Ruta de l’Atzar video would you love to visit?